Rubber rollers have had a role in multiple industries for over 100 years. At first, they could only be produced with natural rubber from trees found in southeast Asian countries. Eventually a formula for synthetic rubber was developed, allowing rubber roller manufacturers greater flexibility in their roller production. Since those early days of roller manufacturing, the construction and agricultural industries have heavily utilized rollers of varying materials designed to withstand harsh elements and heavy wear. However, not all rollers are constructed the same even when they serve similar purposes and it’s important to know what to look for when investigating your rubber roller options. Since 2013, Allis Roller has invested in nearly $1M of equipment to produce rubber rollers and now produces 20,000 rubber rollers per year, so it goes without saying that we take our roller production seriously. Each ‘rubber’ roller material is designed for differing levels of durability depending on the application. At Allis Roller, SBR (styrene-butadiene rubber) makes up the majority of roller production because it meets the heavy durability requirements of our agricultural and construction customers, and ranges from 55 to 85 durometer. Allis Roller is also capable of producing neoprene, nitrile, EPDM, and natural rubber rollers for more difficult environments of extreme moisture or temperatures and to meet customer needs. However, the quality of a rubber roller is more than just the raw material. For rollers used in machinery exposed to the elements, the durability of the completed part is just as important as the rubber itself. 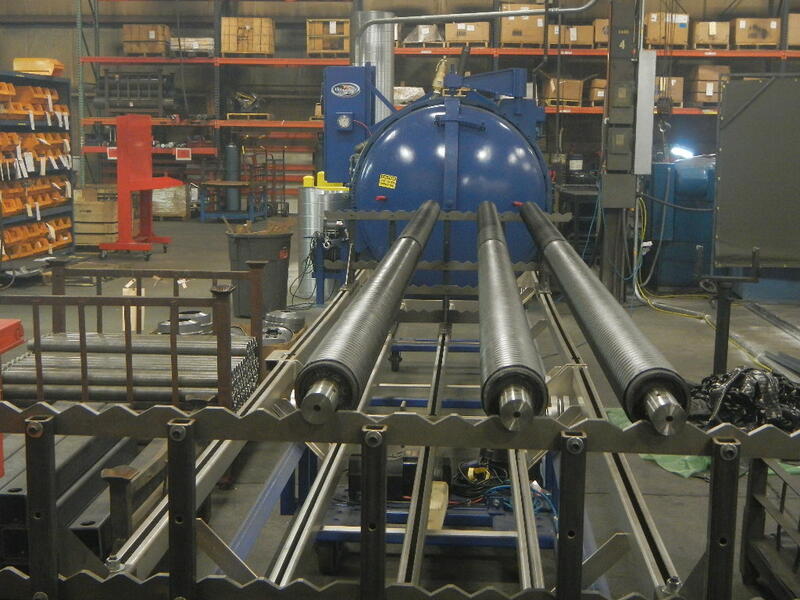 Not all rubber roller manufacturers have developed a system for maintaining quality throughout their product offerings, because it requires substantial machining expertise. At Allis Roller, we have developed a quality control process to assure that all rubber rollers have consistent properties, particularly the adhesion to the steel cores. Though the rubber material may last through extremely hot or cold temperature, and under significant pressure, poor adhesion to the core will eventually cause equipment breakdown costing more time and money in the long run. Given the expense of work stoppage, rubber rollers done right the first time is an essential investment. Core adhesion is not the only process that can impact quality. Not all rollers are created equal, and depending on the application, custom designs can make all the difference. Allis Roller offers hot-knife grooving or contouring after strip building and vulcanizing processes are complete, creating the perfect custom roller for your application. Grooving and contouring the roller allows for a better, more custom fit according to your needs. Our machinery can perform a multitude of post-vulcanizing machining operations resulting in grooves, contours and tapers to fit a variety of equipment specifications. For more information on rubber roller materials, applications, and quality issues and solutions, get in touch with Allis Roller today through our Contact page.